With a wide range of modern, energy efficient split, ducted and multi-split systems we can find a solution for every need. Building a New home? Looking to increase the value of your home? Is It time to replace or upgrade your existing system? Can’t sleep at night? Lounge room too cold for Netflix? Split Systems are designed to heat or cool one single area of your home, they are convenient and cost-effective way of conditioning one part of your house for year round comfort. Split systems can be installed in a range of configurations from as little as $1670*. We have found Mitsubishi Electric Air Cond itioners to be, by far, the most reliable and popular brand for reverse cycle split systems. Mitsubishi are world-leaders in reliability, quietness and energy efficiency. Designed to heat or cool small to medium sized applications the Mitsubishi Electric range from Climax Air Conditioning provides a versatile, yet affordable air conditioning solution. The award wining “AP series” s has a uniform, streamlined design regardless of the size and model of the unit. The simple yet high-quality appearance is designed to blend in with any interior. A “Quiet Mode” setting has been added to the fan speed settings, ensuring super quiet operation as low as 18dB*. Perfect for the bedroom. The vertical and horizontal vanes are double the size of the previous model, allowing the airflow direction to be adjusted and improving airflow control effectively. These functions can be activated at the touch of a button on your remote controller. The ever popular promotion is back for 2019. Purchase an eligible split or ducted air conditioning unit and receive a BONUS Eftpos Gift Card. Cards are redeemed online through Mitsubishi and can be used anywhere that accepts Eftpos! The AP range is elegible for up to $200! ActronAir is an Australian owned company with a state of the art factory in Western Sydney, allowing quick and easy access to units and spare parts. With its sleek form and clever features, the split system range “Serene” will keep your home warm and cosy in winter, cool and fresh in summer and stylish all year round. 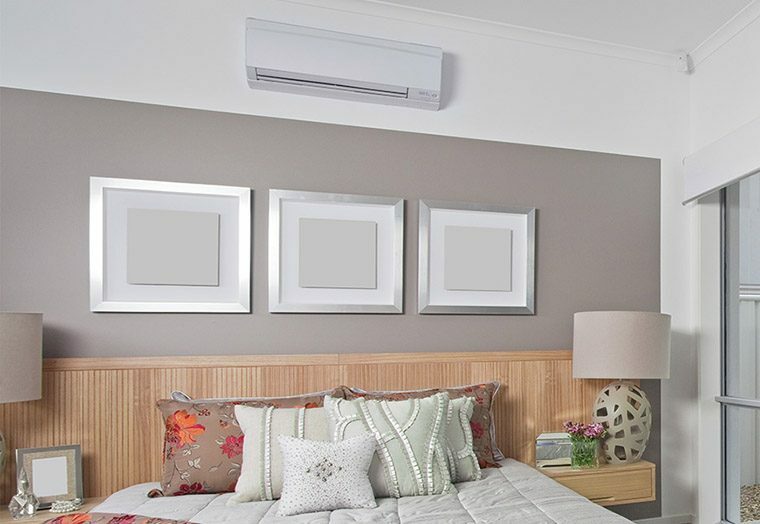 It’s perfect for apartments, living areas or single rooms and with the greatest temperature operating range on the market, you can take comfort that the Serene will be there for you in those sizzling heat waves, or Arctic cold snaps. On a Budget but still want quality and reliability? Then Carrier Pearl Split Systems could be your solution. We have found these systems popular with customers looking to increase the value of a rental or holiday property. The Pearl range features DC Inverter technology designed to use electricity efficiently and effectively. *Inc GST. Back to back installation of a Carrier 42QHC020. Prices may vary depending of unit size and installation type and location. *Inc GST. Back to back installation of a Mitsubishi Electric MSZ-GL50KIT. Prices may vary depending of unit size and installation type and location. *Inc GST. Back to back installation of a Mitsubishi Electric MSZ-GL80KIT. Prices may vary depending of unit size and installation type and location. *Inc GST. Back to back installation of a Toshiba RAS-36BKVS-A. Prices may vary depending of unit size and installation type and location. With personalised design and strategically placed outlets, Ducted Systems are designed to heat or cool multiple areas or even the whole house. Reverse Cycle Ducted Systems offer the flexibility of zones to maximise their efficiency and increase your comfort. Climax can offer a range of units from a small ducted system that can suit a villa or a few rooms, to large kilowatt systems that can keep the whole family happy. For example; a two bedroom villa with an open plan Kitchen, meals and living area could start from as little as $8,000 for a 7kW system, 2 zone, 5 outlet system. A large family home with 4 bedrooms, open plan Kitchen, meals and living area, plus a study, media room and formal lounge can go as large as 17Kw, 4 zones, 8-10 outlets and start at $12,000, with every option and size in between! Whether you are looking for a consistent heating and cooling solution for the home or office, Mitsubishi Electric offers state-of-the-art technology that is quiet, simple to use, reliable and above all, energy efficient. Mitsubishi Electric have a commitment to quality, service, research and development which has allowed them to gain a leading position in today’s marketplace. The reverse cycle ducted units are ideal for multiple room applications and can incorporate zone control for complete control at the touch of a button. For the next level in comfort the Australian owned and made ActronAir offers the ultimate control and efficiency in ducted reverse cycle air conditioning. Climax Air Conditioning have found the Platinum range to be the most efficient and popular choice for whole of home, or office, comfort. The combination of ESP Technology (Energy Smart Performance), world leading Tru-Inverter technology and temperature control to a fraction of a degree, makes the Platinum range up to 75% more efficient than traditional ducted systems. Upgrade to the Platinum Ultima range for absolute control and comfort. The Ultima allows the sensors in each zone or room to maintain the set temperature across the whole house or office. You can set individual temperatures in zones or rooms, individually turn areas on and off or control everything from the master controller. Want more details or need a quote? You can contact us to book a site inspection on 1300 13 89 86 or if you have a house plan you can send it via the request a quote feature and we can organise a quote to be emailed back.